Solar Cell Breakthrough, Changing the Face of Solar Energy! If the scientists at Notre Dame University have their way,we'll soon be painting on solar cells unto the roofs of buildings, versus installing expensive solar panels. According to article, " Notre Dame heralds paint-on solar cells...", Notre Dame scientists have developed a nanotech paste (more like like a paint), that contains quantum dots of titanium dioxide, which when coated with cadmium sulphide or calcium selenide and then mixed with water and alcohol, can conduct electricity. [Nanotechnology is the study and application of extremely small (microscopic) things. It can be used across all the science fields, such as chemistry, biology, physics, materials science, and engineering]. This paste is then painted on to an electrode which is held in place by ordinary office tape. All these components are then sealed using a heat gun and a solution added and sandwiched with another electrode, to create the solar cell. Please read the above article for more details. When light is shone on the solar cell, electricity is generated. Now, the efficiency of these first generation solar cells is said to be about 1%, versus the 10% efficiency now being had with solar panels, but they cost a minute fraction of what solar panels cost. However, the Notre Dame scientists say that there is much more room for improvement in the efficiency of these solar cells. If these scientists can get this right, I see a tremendous breakthrough for the use of solar cells in the Caribbean and in other countries with an abundance of sunlight. Countries whose residents now need government help to buy solar panels, due to the expense of these panels. It is also imperative that North America and other developed countries in Europe and the East, also take an active interest in enabling solar cell research. Because if scientists can improve the efficiency of electricity generated by solar cells, this dependence on expensive Middle East and own-country oil would be diminished. Thus completely reversing the recessionary tendies now happening in these countries' economies. (For all these countries, over half of their import bill is spent on oil). The big question, though, is the politicians, many of whom are funded by big oil companies. Citizens of these countries would have to strongly lobby their governments in order to make them pay attention to using solar cell technology to decrease their countries' oil import bill. (I would like to thank DrWurm for the use of his Flickr inset photo above of organic solar cells being grown in the Polymer Lab at California Polytechnic State University, San Luis Obispo,USA). 1) Article, "Notre Dame heralds paint-on solar cells, wants to smear your home with its goop (video)" by Zachary Lutz, Engadget, December 25,2011. JPS Customers Can Now Sell Excess Electricity Generated, Back to JPS! (Sections marked * were updated on October 20,2011). Jamaica Public Service customers who generate their own electricity from renewables, can now sell the excess electricity generated back to the JPS! [The renewables include photovoltaic cells (solar energy) and wind energy]. The announcement came from the Office of Utilities Regulation (OUR), yesterday. Residential customers can sell up to *10kW (kilowatt) back to the JPS, whilst commercial customers, up to *100kW. In order to do this, customers will have to apply to the JPS as an Independent Power Producer (IPP) and apply for a licence as an IPP, from the OUR . However, please be aware that the money you will get from the sale of excess electricity, will be far less than retail rate, which is what established IPPs have been complaining about for some time. 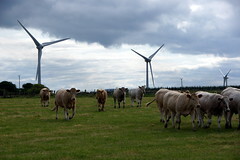 But it's money nonetheless, to help you offset the initial costs of installing and maintaining the renewables. *[The Development Bank of Jamaica is offering loans for installing renewables of up to JMD $5 million dollars, at an interest of 9.5% per annum, with a payback of ten (10) years. A listing of alternative energy suppliers is available from their website]. (Please take a good look at the inset picture. It is of a solar-powered garage..with capacity (ability) to generate 27,000 kWh of electricity annually. Many thanks to eastpole for providing the above Flickr pic, entitled, "IMG_4522 - solar parking garage at Sunnybrook". Please take the time to read the information beneath the above Flickr picture...it's very informative for those of you who wish to use renewable energy for your office or home). A wind-powered car called Wind Explorer, made its first cross-continental journey on February 14,2011. [The Wind Explorer is a prototype electric vehicle weighing 200 kg (441 lbs) including its battery pack. (According to TheFreeDictionary.com, a prototype is an original, full-scale, and usually working model of a new product or new version of an existing product)]. The trip took the Wind Explorer throughout the continent of Australia. Specifically across the states of Western Australia, South Australia, Victoria and New South Wales, arriving in Sydney on February 14. It took drivers, television host - Dirk Gion and German engineer - Stefan Simmerer, 18 days to cover 5,000 km (3,107 miles), but they did it! 3) The longest distance covered by such a vehicle in 36 hours. The car was hooked up to a kite at certain times during its journey, depending solely on the wind generated from the kite, to run the car. The vehicle’s 8 kWh lithium-ion battery pack was recharged overnight using a portable wind turbine that sits atop a six-meter (20 ft) telescopic bamboo mast – or via the grid when there was no wind. (Yes friends, they hooked it up to a normal electrical socket, to charge it when there was no wind). This allowed the car to complete the 4,800 km (2,983 mile) journey on less than a whopping US$15 of electricity! The car's structure is made primarily of ROHACELL sandwich carbon fiber over an aluminum frame making it weigh 200 kg (441 lbs) versus the usual 2,268 kg (5,000 lbs) for a normal car. The funny thing is that the prototype had to use bicycle tires to reduce rolling resistance and so Dirk and Stefan had to make several tire changes, in order to finish their journey successfully. (Rolling resistance increases the amount of energy need to make the car move). Now you may be sitting at home/work and wondering what all of this means for you. 1) Lighter cars, using wind energy to generate electricity to power its engines. (Only wind-generated electricity and electricity from the grid are needed for it to operate). That's electricity versus gas needed to operate this vehicle...meaning less costs to a potential car owner and huge reductions in the oil bill of countries who will permit the sale of these vehicles. b) Narrow streets/roads are common (the Netherlands and Netherlands Antilles come quickly to mind), thus reducing the need for gas-run vehicles on these roads. For a lower oil bill means more money in government coffers to spend on the health, education and well-being of its people. People who are well-educated, well-nutritioned and healthy, make for more productive citizens...and provide great incentives for foreign investors to come into your country, with well-needed foreign exchange. Foreign exchange that which will in turn boost your economy and enable your government to buy only essential imports, sans the oil. Please see the article,"Wind-powered car completes cross-continental journey", for a picture of the car and its journey across Australia.